The streets of Okinawa will be filled during a four-day period starting Wednesday, but most stores won’t be closed. Obon is a time for celebrating life, and welcoming ancestor spirits home for a family reunion. It’s a Buddhist event, where ancestor spirits are believed to return to the human world in order to visit relatives. It is also called the Urabon, the Feast of Lanterns. Traditions are everywhere, and you will see them at every turn during the coming days. It is said that on this single day of the year, the iron port of hell is opened, and the deceased are allowed to leave. Buddhist services are held at temples and in private homes for ancestors, friends and relatives who’ve died, with particular focus on those who’ve died within the past year. During the Obon period, which officially ends August 16th, Okinawans will visit their family tombs, offer food and prayers, and communicate with the spirits. They will also offer up food at their home altars. The final day of Obon is Uukui, a time when the family gathers and celebrates with a lavish dinner, preparing to send their ancestral spirits back to the other world. A variety of foods are offered, and special paper money, Uchikabi, is burned as an offering to the spirits for use in the other world. Uchikabi is paper printed with a coin pattern. About midnight, family members will remove offerings from the altar and move them to the family gate in front of the home, incense lit, the uchkabi burned, and families say goodbye for another year. 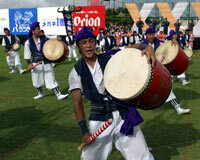 The Okinawan tradition is that spirits will carry the uchikabi money with them, and use sugar cane stalks as walking sticks. Obon is an important event socially, as well as from a religious perspective. It is a time when it is nearly mandatory that family return home to be together. Years ago, it was required that all family gathered for Obon, and for events on Jan. 15. Obon is celebrated from the 13th –15th day of the seventh month of the year, which is July on the lunar calendar. It is commemorated this way on the mainland. Obon is also a time for Okinawans to share, and to give gifts. Ochugen, the presentation of gifts to relatives and bosses in the workplace, is traditional. Stores will chalk up tens of millions of yen in sales, with typical ochugen gift sets of food seasonings, towels, beer and gift certificates.